WHITEHALL, MI – In the calm waters of Lake Michigan, north of White Lake, John Hanson emerged from the depths, his form taking shape in the bubbles that preceded him. Hanson broke the surface and reached for a ladder rung. Then the 59-year-old scuba diver from Montague climbed up on deck and announced his find: the Interlaken, a 170-foot wooden schooner. It had foundered and sunk in a fierce Lake Michigan storm in 1934. The Interlaken hull lies in 15 feet of water, much of it under sand. It was once a handsome three-masted cargo ship, built in 1839 by the Abram Smith and Sons shipyard, of Algonac, on the St. Clair River. 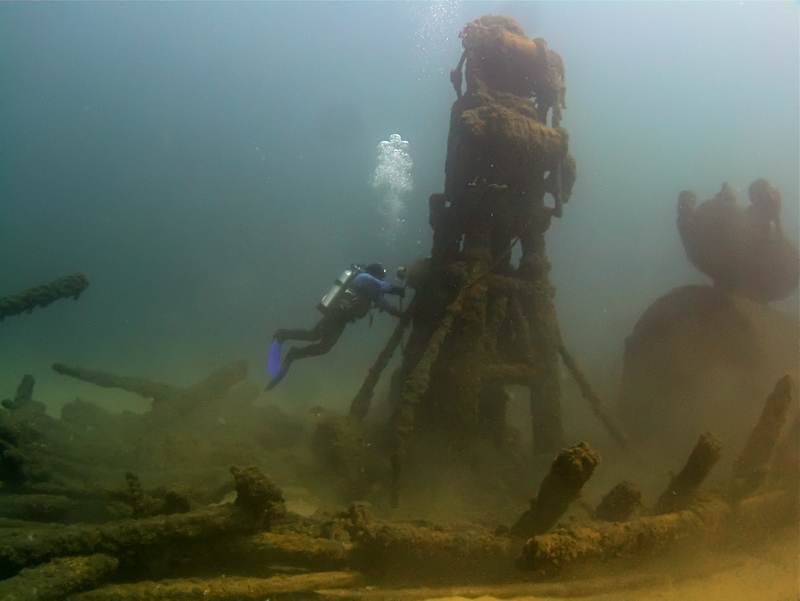 Today it is one of a dozen charted shipwrecks in the 400-square-mile West Michigan Underwater Preserve (WMUP), our state’s newest underwater museum. The Preserve was dedicated in 2012 and is open to the public. Hanson, an experienced wreck diver, is chairman of the Preserve’s board of directors. The Preserve is one of 14 found on lakes Michigan, Huron and Superior. All are part of Michigan’s Underwater Preserve System. 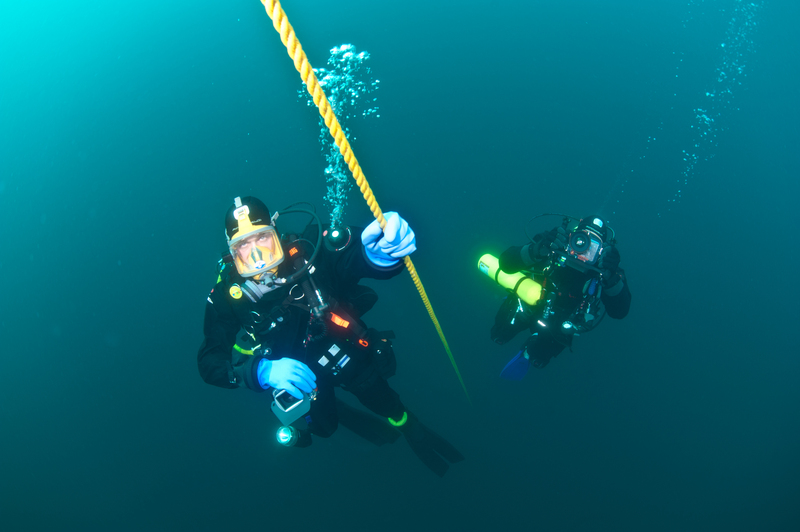 The state program was created in 1980 by legislation with support from Michigan sport divers who were concerned about protecting maritime antiquities. 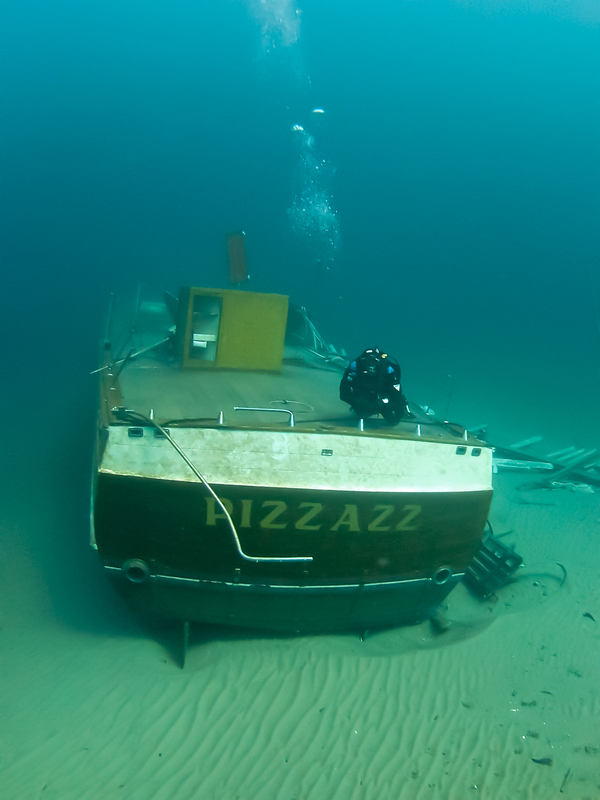 State officials estimate as many as 6,000 vessels have gone to the bottom of Lake Michigan and other Great Lakes. Approximately 2,000 are located in Michigan waters. It is illegal to remove artifacts from the sunken ships. Information about the shipwreck sites is available at michiganpreserves.org. Diving this day proved a bit of a challenge, as visibility was not at its best. Recent storms had made the nearshore Lake Michigan waters cloudy. Hanson knew the Interlaken’s GPS coordinates, but he didn’t drop anchor until he saw the wreck’s image outlined on the electronic side-scan sonar he uses on his boat. ROV, or remotely operated vehicle. 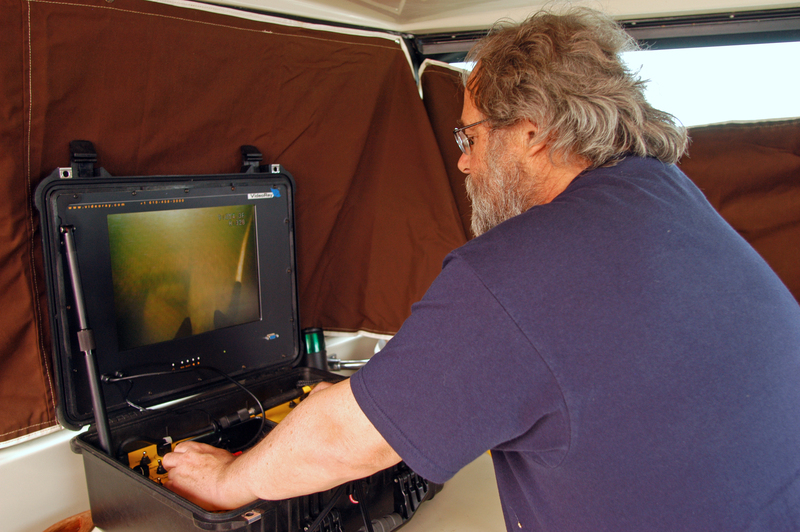 Gleason, a Hospitality, Tourism and Management professor at Grand Valley State University, is a professional ROV pilot who has used them to explore for Great Lakes shipwrecks and offshore oil wells in the Middle East. 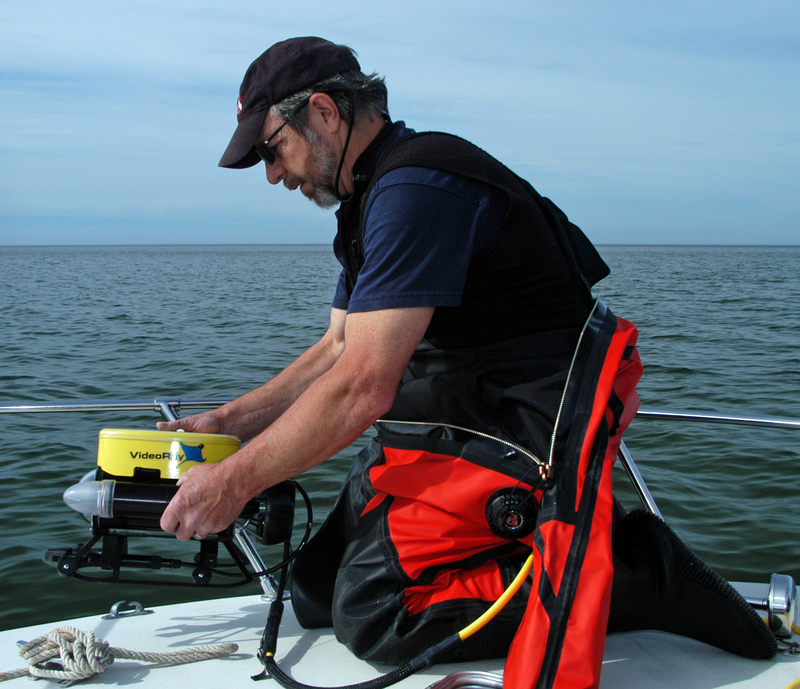 His device is equipped with a video camera that transmits images to a portable monitor in the boat cabin, where Gleason controls its movements with a joystick. “There’s the bottom,” Gleason called out cheerfully after Hanson launched the ROV from the front deck. “And there’s the wreck,” he added a few minutes later, prompting Hanson to suit-up and go over the side. Michigan, so they motored 5 miles north hoping for clearer water at the Interlaken. The West Michigan preserve stretches from Port Sheldon to north of Ludington. It is the resting place for ships like the Anna C. Minch, a 380-foot freighter that sunk in a 1940 storm, and the 320-foot Henry Cort, a bulk-cargo ship that sunk off Muskegon in 1917, among others. Hanson began diving in high school, inspired by the 1950s and ‘60s era “Sea Hunt” TV series, starring Lloyd Bridges as the rugged, ex-Navy frogman, Mike Nelson. Shipwreck diving came later. He made his first wreck dive nine years ago on the 253-foot long Salvor, a steamer built in England that sunk in 1930 between Muskegon and Whitehall. 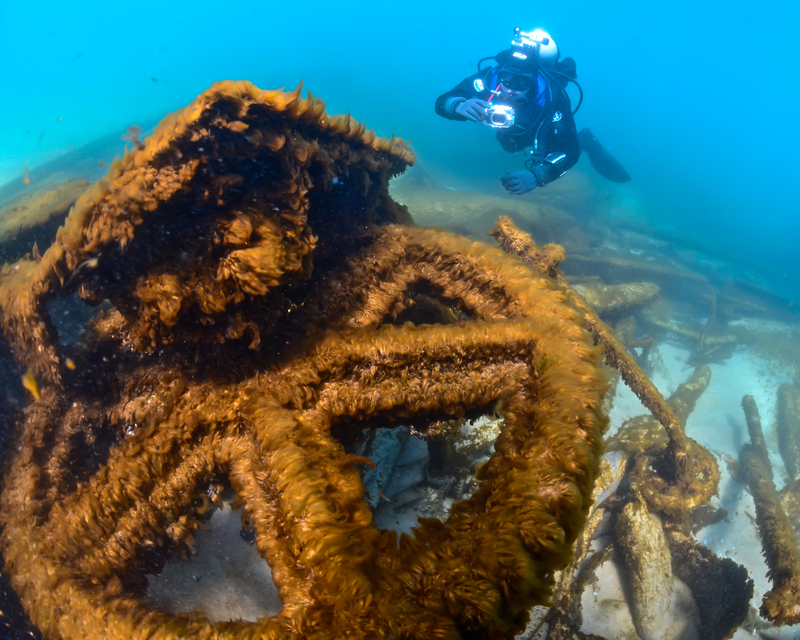 stories of lives lost or forever changed, is part of the appeal for divers and tourists who visit the preserves, explains Debbie Chase, a Great Lake Energy Cooperative member from Walkerville and president of the Michigan Underwater Preserve Council. She is also vice-chair for the West Michigan Preserve. “I read about shipwrecks in my 20s and thought they would be very scary to dive upon. But they are fascinating,” said Chase, who began diving in 2004 with her husband, Paul Chase, the underwater photographer. Shipwreck Preserve. It was a sailing vessel and still has coal on it,” Chase said. The William Young sits upright in 120 feet of water. The 139-foot wooden schooner was built in 1863 in Marine City, MI, and its home port was Detroit. It sank with a load of coal in 1891 and is one of 13 shipwrecks in that preserve. Chase notes, and can be a family vacation destination. All are located near one or another shoreline community, she adds, where family members that don’t dive can enjoy themselves at local beaches and shops. This story appears in Michigan Country Lines Magazine. This entry was posted in Uncategorized and tagged Adventure Travel, Diving, Great Lakes, Maritime antiquities, Michigan Underwater Preserve Council, Michigan Underwater Preserves, ROV, Scuba, Shipwrecks, Straits of Mackinac Shipwreck Preserve, Tourism, West Michigan Underwater Preserve. Bookmark the permalink.